At this point, 10 months from the Iowa caucuses, when a mainstream-media story mentions the 2020 presidential campaign, I ignore it. The now-perpetual presidential election campaign cycle, featuring somewhere between 15 and 50 Democrat Party contenders, may be good fodder for media advertising sales, but most of it is just meaningless talkinghead blather. The current Demo presidential primary strategy is to field a lot of candidates with the objective of rallying each candidate's constituency into a frenzy, and then folding all those constituencies into one massive voter "amalgamation of dunces," as I fondly refer to it, amassed behind one nominee in order to defeat Donald Trump. It's a good strategy, despite the fact that some conservative commentators brush off the number of Demo candidates as humorous political folly. But take note -- something noteworthy is happening within this Demo amalgamation. While most Democrat bets are on the mainstream "socialism-lite" 2020 candidates, the interest meters measuring leftist grassroots support for Bernie Sanders and Robert Francis "Beto" O'Rourke are in the red zone. A month ago, when Sanders officially announced his presidential campaign, he collected $5.9 million from 223,000 donors in the first 24 hours. Of course, he still has a network of donors from his 2016 primary campaign against Hillary Clinton, which was going well until she and her DNC hacks sandbagged Sanders and his Millennial supporters. But both his donation total and donor total are compelling barometers of his national support. Enter the latest Demo presidential wannabe, Beto O'Rourke, who in a 9,000-word puff piece, fittingly published in Vanity Fair, declared, "I want to run. ... I want to be in it. Man, I'm just born to be in it." O'Rourke, after three terms in the U.S. House, raised a record-breaking $80 million from his national network of donors to fund his 2018 Senate campaign — in which he was narrowly defeated by Ted Cruz in Texas, a conservative state. In the first 24 hours after announcing his presidential campaign, O'Rourke used that network to raise $6.1 million, topping Sanders's initial intake, though his haul came from just 128,000 donors. As for other Demo candidate returns in their first 24 hours, Sen. Kamala Harris (D-CA) raised just over $1.5 million from 38,000 donors, and Elizabeth Warren (D-MA) raised just $300,000 from 8,000 donors (perhaps most from her Cherokee cousins). The early fundraising records of other Demos goes downhill from there. So what do the first 24 hours tell us? Well, I would argue it's indicative of enthusiasm, and in the case of both Sanders and O'Rourke, that enthusiasm is considerable. According to ActBlue, the Democrat Party's dominant donation-processing platform, a review of their past campaign fundraising indicates that Sanders and O'Rourke have strong small-donor support, which means broad support. This led The New York Times to declare that they are "poised to be a fund-raising phenom." And indeed, they are. Of course, as investment disclaimers note, "Past performance is no guarantee of future results." And there is the question of whether Sanders and O'Rourke can continue to raise enough money to be competitive. But I believe the big-money paradigm is changing for Democrats, who tend to do a much better job than Republicans of rallying grassroots voters. A major reason for this shift is that Democrats are increasingly building entire constituencies on identity politics, though there are some fissures in those identities. And they're now as adept at creating identity constituencies as they are at promising free stuff in return for your vote. I would argue, given Trump's very narrow margin of victory in 2016, that had Clinton not alienated Sanders's voters, she most assuredly would have defeated Trump. After Sanders announced, I warned that Republicans had better take him "seriously and literally," and I would issue the same warning in regard to O'Rourke. So what's the connection between O'Rourke and Sanders? Remember back in 2008, when a charismatic young candidate named Barack Obama came out of nowhere to win his party's nomination and, after putting a much older, much more seasoned Democrat, Joe Biden, on his ticket, won the presidency? Yes, Obama was a lot "smarter" than O'Rourke, although as Ronald Reagan once observed about leftists, "The trouble with our liberal friends is not that they're ignorant; it's just that they know so much that isn't so." 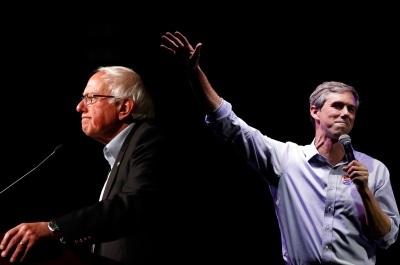 A Beto-Bernie ticket would create a formidable socialist 2020 tag team to oppose Trump. We would likely have never heard of O'Rourke if not for the financial backing of his wealthy wife. Like John Kerry, with whom O'Rourke is compared, Beto married into big bucks. However, Kerry is more a stoic tree Ent while O'Rourke is more a flailing tube-man ad prop. Beto has lived a "white privilege" life. His family is well connected to the political Left — his father was state chairman of Jesse Jackson's presidential bids and held elected positions as an El Paso County commissioner and judge. He graduated from exclusive Woodberry Forest School in Virginia and Columbia University, where he apparently majored in skateboarding and shredding covers on the electric guitar. A quick background check of the 47-year-old candidate uncovers a few notable issues. When he was 16, he was writing sordid stories about killing children. At 23, he was arrested for burglary, but O'Rourke dismissively says, "That happened while I was in college." Ah, he was "in college." Recall that O'Rourke's Democrat colleagues attempted to destroy the reputation of a conservative Supreme Court nominee by fabricating lies about things he did in high school. Regarding his 1998 DWI arrest in El Paso, according to the police report, he hit another vehicle at a high rate of speed and attempted to flee the scene. He was sentenced to attend "DWI school." He now insists, "I've been open about that since the very beginning. ... I did not flee. The police report on this count is wrong." O'Rourke, the son of a then-El Paso County judge, also blew 0.136 and 0.134 on police breathalyzers but told police that he'd "had two beers and had been on cold medication." We suppose the police report on those counts is also wrong. And then there's that troublesome conviction of his mother in 2010 for "structuring transactions to avoid reporting requirements, a felony." In effect, the O'Rourkes were attempting to conceal more than $1 million dollars in cash transactions through a family furniture store — $630,000 of it from one "particular customer" in one year. A U.S. district judge fined Mrs. O'Rourke $250,000 for what Mrs. O'Rourke called a "clerical error," but curiously did not require that she provide the name of the person who gave her the $630,000. Most worrisome, though, is O'Rourke's unmitigated disregard for our Constitution and Rule of Law, and his contemptuous view of the viability of that essential document: "I think that's the question of the moment: Does this still work?" That question should cause every American grave concern. All that being said, some esteemed political observers like Conrad Black, who just penned "Stick a Fork in O'Rourke," believe his probability of a nomination is zero. But where there is smoke, there is fire. Given the Left's populist voter initiatives to ensure Democrat dominance — allowing illegal aliens, violent felons, and 16-year olds to vote, and then discarding the Electoral College — Caveat Emptor! The Leftmedia propagandists are in love with Beto and Bernie, and they'll do everything within their considerable sphere of influence to galvanize his constituents into one massive "amalgamation of dunces" who hate Trump enough to show up at the polls. If they're successful, the 2020 version of the Obama-Biden ticket could be the Beto-Bernie ticket.